This level has medium difficulty. For this level try to play near to blockers and more from the bottom to break the honey blockers. 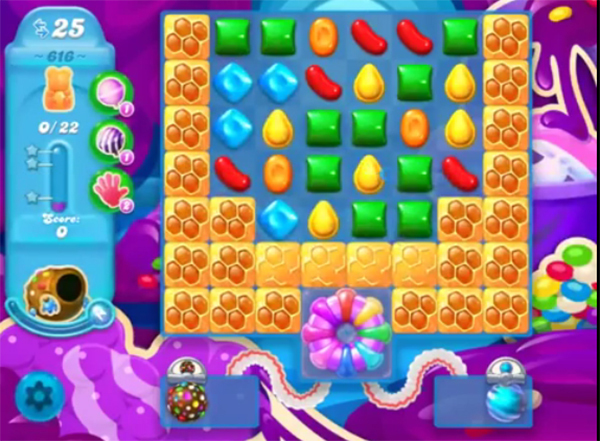 Make special candy as you get the chance and combine special candies with each other to break more honey blockers to save the bears. Or play near to cake as it will help to break the blockers. Medium, my aunt Fanny. You can’t make matches when there are no matches to be made and even when you do they do almost nothing. I played one game where practically everything was a match, matching balls and every other thing and I got about 11 bears. I may not be a great player but I got this far so I’m not a total loss. Played a lot of games that seemed impossible but always won. This one is ridiculous. Making this 616 puzzle so difficult that I dont want to play it anymore. You always have more moves than I do on every level! While the tips are somewhat helpful, it’s frustrating not to have the extra moves . When you finally get close you run out of hearts and have to wait again! Ugh frustrating beyond!